Assistive Technology is an umbrella term used to describe the range of technological devices and aids available to promote, maintain and improve the independence and communication skills of people with disabilities. I act for children who have sustained brain injuries as a result of substandard medical care. The children I represent have individual capabilities and needs. Thanks to advances in recent years many of these children can now benefit from an array of technological interventions. Some children use aids to help them communicate, others use technology to assist them with physical limitations and difficulties with gross and fine motor skills. Here, I focus on the role of assistive technology in the field of communication for children with brain injuries. Augmentative and Alternative Communication (‘AAC’) is used by children who have minimal or no clear speech. Its objective is to replace or supplement existing speech. Impaired or absent speech can result from different types of brain injury including physical causes arising from neurological damage (dysarthria), damage to the brain’s language centre resulting in difficulty understanding and using language (asphasia), learning difficulties like autism spectrum disorder, or conditions such as ‘locked in’ syndrome. There are two kinds of AAC: aided and unaided. Unaided or ‘no tech’ AAC involves the use of the individual’s body, for example gestures, pointing, sign language and facial expressions to communicate. 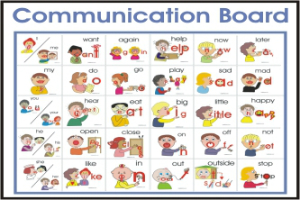 Aided AAC includes the use of aids and equipment to promote communication. This can range from simple ‘low tech’ products that do not require electrical power to more complex electronic devices. Low tech options include printed materials such as alphabet boards, communication charts and picture books. Using these aids children directly select letters, symbols or words to create a message. Depending on the child’s physical and cognitive abilities they may use pointing devices like a beam of light, a head or mouth stick or a switch to choose the option they want. The more complex products or ‘high tech’ communication systems use power and can create and store messages. They employ some of the same selection techniques as the low tech options and where the child’s motor skills are more compromised they can use auditory or visual scanning to select their chosen word or symbol. They can also include an adapted mouse and have built in eye tracking systems which allow the child to gaze at a symbol or letter and select it with their vision, voice and breath. These machines store repeated information and can afford some children more communicative autonomy. They include speech generating devices and voice output communication aids which can be built into the child’s wheelchair, laptop, tablet and mobile phone. How Importa nt is AAC for brain injured children? As human beings our ability to communicate is central to our sense of self and the relationships we build with those around us. For brain injured children with communication impairments AAC complemented by the growing advances in technology can cater for a child’s individual needs and in many cases bridge the gap between a sense of isolation, dependence and voicelessness to feelings of social inclusion, autonomy and self expression. Where does Assistive Technology and AAC fit into the liti gation process? When the Defendants have admitted fault, and interim compensation is available, careful consideration is given to the diverse needs of our clients. Part of this consideration and assessment includes instructing experienced and dynamic experts in assistive technology, AAC and speech and language therapy to consider the equipment that will benefit the children we represent so that we can ensure it is put in place and financed as part of their ongoing therapy package.